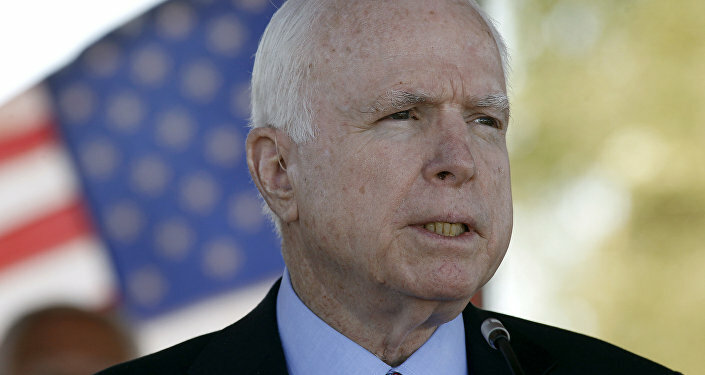 One year after his diagnosis of brain cancer, US Senator for Arizona John McCain passed away at the age of 81. He is survived by his mother Roberta, his ex-wife Carol, his wife Cindy and his seven children and four grandchildren. Earlier in the week, McCain's family announced that the senator had decided to discontinue his medical treatment for an aggressive glioblastoma. "Senator John Sidney McCain III died at 4:28 p.m. [23:28 GMT] on August 25, 2018," McCain’s office said in a statement, as cited by the NBC news. US President Donald Trump and former US President Barack Obama expressed their condolences over the politician's death. John McCain was born August 29, 1936, at the US Naval Air Station in Coco Solo, Panama Canal Zone — a territory of the US from 1903 to 1979. He was his parents' second child: his sister Jean Alexandra McCain was born in 1934. A military brat, McCain's childhood was a transient one, but the family eventually settled in Virginia after the end of World War II. A spirited and rebellious child, McCain was nicknamed "Punk" in high school for his combative disposition. Like his father and grandfather before him, McCain entered the US Naval Academy in Annapolis, Maryland — but there his rebellious streak continued. He received over 100 demerits each year he spent at the academy, earning him the dubious honor of joining the "century club." He graduated in 1958 at the bottom of his class, 894th out of 899. Out of the academy, McCain was commissioned as a naval aviator. In his early days, he was seen as a sub-par flier, even crashing his practice aircraft in 1960, narrowly escaping without major injury. His skills improved with time, although he was always noted as a daring and sometimes reckless aviator. In July 1967, McCain shipped off to join Operation Rolling Thunder, the three-year US bombing campaign against Vietnam. While flying his 23rd bombing mission in October 1967, the 31-year-old McCain's plane was shot down by a North Vietnamese anti-aircraft missile. A wounded McCain was beaten and taken prisoner by the North Vietnamese. Upon learning that they had retrieved the son of a high-ranking admiral, the North Vietnamese nicknamed him the "crown prince." As one of the thousands of American soldiers taken prisoner by the North Vietnamese during the Vietnam War, McCain was subjected to severe mistreatment. After six weeks of captivity, McCain had lost 50 pounds and his hair had turned white. Another captive, future Medal of Honor recipient George "Bud" Day, recalled that he did not expect McCain to last another week. But McCain had what Day called a "fantastic will to live." Shortly after Jack McCain was appointed commander of US Forces in the Pacific, the North Vietnamese offered to release his son in a show of mercy. The younger McCain, having been captive for eight months, replied that the US Code of Conduct for POWs would not allow him to leave before men that had been captured before him, and he refused to be released unless every American soldier captured before him was released alongside him. McCain's torture worsened. He was beaten every two hours, suffering cracked ribs, fractures in his right arm and right leg, and broken teeth — all while suffering from dysentery. Such treatment continued for over a year, but short of an unsuccessful suicide attempt and a single confession of criminal deeds — written in purposefully broken English to indicate it was forced — McCain gave his captors almost nothing. He refused to meet with anti-war groups that visited Hanoi and defied his captors' order to be silent during a filmed church service on Christmas Eve, 1968, loudly cursing and describing his brutal treatment to the cameras. Conditions would improve for all POWs in the end of 1969, but McCain remained obstinate, loudly cheering the resumption of heavy US bombing campaigns against North Vietnam in 1972 after a four-year pause. He spent most of his time in the "bad attitude" section of the camp for his repeated defiance of his captors. McCain would remain a prisoner until 1973, when he was released with almost 600 other POWs as a result of the Paris Peace Accords. He had spent more than five years of his life as a prisoner and his injuries left him permanently unable to raise his arms more than 80 degrees. He was also unable to bend his knees, but regained this ability after nine months in physical therapy. He retired from the Navy at the rank of captain in 1981 after 23 years of service. Now 44, McCain began his fight to join the US House of Representatives. He narrowly won the Republican primary, then easily defeated Democratic challenger William Hergarty and became the third representative from Arizona's First District. A self-described Reagan Republican, McCain typically voted in lockstep with the conservative president: he favored prayers in school, opposed abortion, and supported US military action in Central America in places like Grenada and US aid for the anti-communist Contra rebels in Nicaragua. But in 1983, he earned his "maverick" monicker, breaking with GOP consensus to vote against the continued US Marine presence in Lebanon. The move earned him much praise a month later when an Islamic terrorist group attacked the US barracks in Beirut, killing 241 Americans and 64 others, mostly French peacekeepers. The popular McCain won a Senate seat in 1987, and found himself on the shortlist for then-nominee George HW Bush's running mate in the 1988 presidential election. His speech at the 1988 Republican National Convention about his experiences as a POW drew a standing ovation. McCain would become the subject of the largest scandal of his career in 1987 when he became embroiled in the Keating Five scandal, when American businessman John Keating, Jr. and his Lincoln Savings and Loan Association came under federal investigation for illegal investments. McCain was one of five senators who Keating asked to intervene on his behalf. Keating had donated hundreds of thousands of dollars to McCain's various political campaigns. Reluctantly, McCain agreed to meet with federal regulators on Keating's behalf, which he in 2002 called "the worst mistake of my life." In 1989 racketeering charges were brought against Keating, and McCain and the other four senators came under investigation. Although McCain was rebuked for "poor judgment" by the Senate Ethics Committee, they ultimately concluded that his involvement was the least of the five and his lapse in judgment did not require "institutional action". In the Senate, McCain supported the declassification of US and Vietnamese files on American soldiers missing after the war. He also pressed for a normalization of relations and an end to the trade embargo with Vietnam, arguing that the US' former enemy could be a valuable regional counterbalance to China. This earned him enmity from some fellow POWs and veterans. In 1995, McCain began to battle the influence of money from major donors on US politics. He and Wisconsin Senator Russ Feingold worked to reform campaign financing, a measure meant to limit the money that organizations such as corporations and unions could funnel to political parties, who would then pass it along to candidates. The bill was filibustered in 1996 and again in both 1998 and 1999, but an altered version would be signed into law in 2002. He would continue to oppose the Republican party on occasion, slamming bills like the 1996 Freedom to Farm Act and the 1996 Telecommunications Act as "appeals to special interests dolled up as protections for ordinary citizens." In 1999, 63-year old McCain released his first book, the family memoir "Faith of My Fathers," and announced his intention to run for president. But the 1999 Republican field was a crowded one. Texas Governor George W. Bush eventually rose as the dominant candidate, going on to win 43 of the 50 states, including a bitter South Carolina primary that would become infamous as one of the ugliest primary campaigns in American history. After September 11, 2001, McCain became a highly visible voice of civilian leadership in the country, warning the American people that they were in for the long haul against what he described in an October 2001 editorial in the Wall Street Journal as a "depraved, malevolent force that opposes our every interest and hates every value we hold dear." McCain became a leading crusader for security measures that would later become highly controversial, such as the USA PATRIOT Act. He also co-sponsored the bill that would lead to the creation of the now-infamous Transportation Security Administration. Although McCain supported the US invasion of Iraq, he would soon lose confidence in the Bush administration's handling of the war, publicly slamming Defense Secretary Donald Rumsfeld's handling of the war. However, McCain vigorously campaigned on Bush's behalf during his reelection bid, and at the 2004 Republican National Convention praised Bush's security record and his decision to invade Iraq. So great was McCain's popularity in 2004 that he won his Senate reelection bid with 77 percent of the vote — even gaining a majority of votes cast by Democrats. McCain remained unafraid to criticize the White House — including opposing so-called "enhanced interrogation techniques" used on captured militants. McCain also announced that he intended to see the infamous Guantanamo Bay detainment camp closed and he questioned the effectiveness of Bush's policies in Iraq. On April 25, 2007, 71-year-old McCain announced he was running for president again. Despite being the most visible of all Republicans, his campaign was beset with early difficulties due to his support for unpopular immigration policies. He had some success with town hall meetings and became an early adopter of social media for political purpose, with accounts on Facebook, Myspace, and YouTube. McCain would eventually emerge as the frontrunner in a crowded Republican field, but would watch Democratic contender Barack Obama rebound quickly from his bitter primary battle with Hillary Clinton and go on to raise four times as much money as he. The Obama campaign framed McCain as a "third term for Bush" and ran a platform that appealed to youth voters, compared to the more old-school McCain. McCain's campaign urged him to make a daring choice for his running mate, so he chose Alaska Governor Sarah Palin. At the time, Palin was a virtual unknown in national politics, but her youth, reformist policies, appeal to social conservatives who were, at best, lukewarm on McCain, and appeal to female voters made her a compelling pick — at least at first. However, Palin was also seen as undercutting McCain's central arguments against Obama: she was young, inexperienced, favored style over substance, and seemed unqualified. McCain would lose the general election, picking up 46 percent of the popular vote and 173 electoral votes. his criticisms of Obama. He also supported the enormously controversial Arizona Senate Bill 1070, at the time the strictest anti-illegal immigration bill ever passed in Arizona. But he would again demonstrate his willingness to undertake bipartisan legislation with his membership in the "Gang of Eight" would-be immigration reformists in 2013, returning to his "maverick" ways. He criticized the non-interventionist policies of other Republican senators such as Rand Paul and Ted Cruz and he joined Obama in a vocal push for the US to arm and train Syrian rebel groups in the early days of the Syrian Civil War. McCain also criticized Obama for the rise of Daesh in Iraq, arguing that Obama's haste to surrender American military gains in the nation to score political points set the backdrop for the new civil war. He supported the protests against Ukrainian President Viktor Yanukovych and became an influential adversary of Moscow on Capitol Hill. McCain also supported the Saudi military intervention in Yemen in 2014. In 2014, McCain became chair of the Senate Armed Services Committee. He was arguably the most vocal Republican opponent of then-candidate Donald Trump, calling Trump's comments "uninformed and dangerous" in March 2016. Although he eventually endorsed Trump, McCain withdrew that support following the release of the "Access Hollywood" tape, because "demeaning comments about women and his boasts about sexual assaults" made it "impossible to continue to offer even conditional support." As allegations of Russian interference in the 2016 election went from an issue to arguably the issue of the day on Capitol Hill, McCain became a leading voice in the camp pushing for a sweeping investigation into the allegations. McCain was the one who delivered the infamous "Golden Showers" Steele dossier to FBI director James Comey in late 2016 and was a strong proponent of the new package of sanctions passed against Russia by the US in July 2017. But only a few months into his sixth term, the 80-year-old McCain suffered a major health scare. In July, he revealed that he had been diagnosed with an aggressive brain tumor. Two weeks after the surgery, McCain returned to the Senate to cast a vote for the failed Republican bid to replace the Affordable Care Act. An icon of American politics since the days of Reagan, McCain has been the recipient of many awards, notably becoming the only foreigner to ever receive the Order of National Hero from the president of Georgia in 2010. While he never achieved his dream of becoming president, McCain came far closer to that than most men ever would. An elder statesman of the US Congress, thought by his critics an obsolete relic of times gone by and his supporters the longest-tenured honest man on the Hill. Whatever he was, his decades of service are not likely to fade into history anytime soon.